How can I best view the Lyrids meteor shower? If you live near a brightly lit city, drive away from the glow of city lights and toward the constellation from which the meteors will appear to radiate. For example, drive north to view the Lyrids. Driving south may lead you to darker skies, but the glow will dominate the northern horizon, where Boötes. rises. Lyrids meteors will appear to "rain" into the atmosphere from the constellation Boötes., which rises in the northeast around 11 p.m. in early-January. After you've escaped the city glow, find a dark, secluded spot where oncoming car headlights will not periodically ruin your sensitive night vision. Look for state or city parks or other safe, dark sites. Once you have settled at your observing spot, lay back or position yourself so the horizon appears at the edge of your peripheral vision, with the stars and sky filling your field of view. Meteors will instantly grab your attention as they streak by. A bright meteor may leave a ghostly glowing trail after it has passed. The technical name for this is a train - i.e. the fast moving streak is the meteor's trail and a glowing remnant of the trail is known as the meteor's train. If you can see each star of the Little Dipper, your eyes have "dark adapted," and your chosen site is probably dark enough. 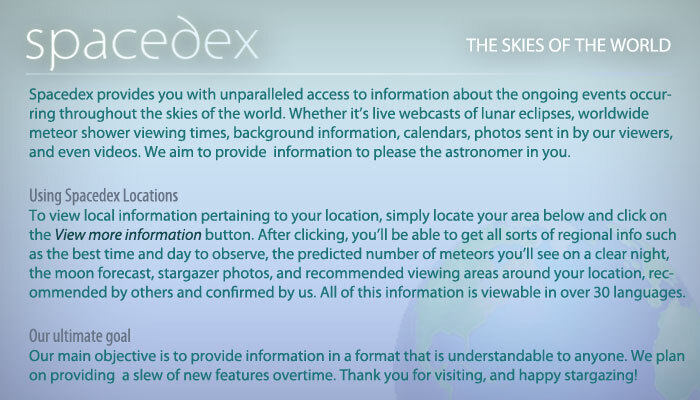 Under these conditions, you will see plenty of meteors. Circle December 14th on your calendar, for early that morning a moderate to possibly very strong showing of annual Geminid meteor shower is likely. The very strong display will favor those living across much of the Northern Hemisphere. In this region, meteor rates might briefly rise to a few hundred per hour (the time frame for the most intense activity is anticipated sometime around 21:40 GMT). A far more modest, but still potentially enjoyable display of a few dozen Leonid meteors per hour is expected to favor North America. In the United States and Canada, eastern observers will be particularly well-positioned for maximum activity, expected sometime between 3:30 and 5:30 a.m., when the radiant of the Leonid shower will be well up in the dark southeastern sky. Waxing Crescent Moon. Meteor shower gazing conditions will be ideal as there will be little moonlight to interfere with observing. Name origin: Appears inside the constellation Boötes. Recorded history of the Lyrids coming soon. Name origin: Appears inside the constellation Lyra. Stay tuned as the Spacedex write up is currently in progress. The Lyrids are the second major meteor shower of the year, but it is not one of the strongest. This annual Spring shower is recognized as an irregular shower, with rates that vary depending on the year. 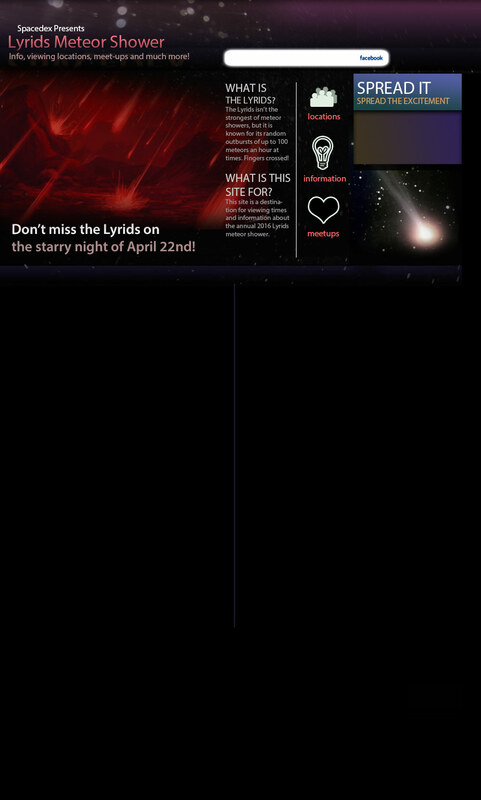 Like all meteor showers, the Lyrids are caused by the Earth passing through the dust particles of a comet. In Lyrids case, this comet is Thatcher (C/1861 G1). Due to the complete lack of significant meteor shower activity from mid-January to Mid-April, the Lyrids meteor shower is often a pleasurable, if not relaxing experience for observers longing for a show in the night sky after three and a half months of waiting. The 2016 Lyrids are active from April 16th through April 25th and reaches its peak, the moment when the most meteors can be seen, on the mornings of April 22nd and April 23rd. The peak is defined as the moment of maximum activity, and this number is expected to range from 10 to 20 Lyrid per hour if conditions are ideal. Unfortunately, for observers eager to for a dark sky this year, the Moon Moon may wash away all but the brightest Lyrids meteors, creating a less than ideal viewing experience due to the natural light present during the shower. Enthusiastic star gazers waiting it out under the night sky may be lucky enough to catch several Lyrids. 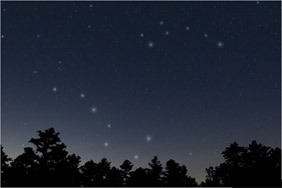 The radiant of the Lyrids, also known as the point from where the meteors appear to come from, is situated within the constellation Lyra. Not coincidentally, the Lyrids are named after this constellation. To find the location of the radiant, we recommend you find Vega, a hard-to-miss star identified as the brightest star in the constellation Lyra and one of the brightest stars in Earth’s night sky (it’s the fifth brightest in the night sky and the second brightest star in the Northern Celestial Hemisphere). On average, and under clear skies, observers should see 10 to 20 meteors per hour but very rarely these rates can exceed up to 100 meteors per hours due to extremely rare outbursts. In the best conditions, the Lyrids meteor shower will put on a slow show for those willing to stay out and watch. If you happen to live near a brightly lit city, if possible, we recommend that you drive away from the glow of city light. After you’ve escaped the glow of the city, find a dark, safe, and possibly isolated spot where oncoming vehicle headlights will not occasionally ruin your sensitive night vision. Look for state or city parks or other safe, dark sites. Once you have settled down at your observation spot, face toward the north-northeastern portion of the heavens. This way you can have the Lyrids’ radiant within your field of view. If you can see each star of the Little Dipper, your eyes have "dark adapted," and your chosen site is probably dark enough. Since viewing conditions for the Lyrids will be ideal this year, you will have a greater opportunity to see more Lyrids than observed during the prior year. We suggest that you dress warmly, bring a chair that reclines, or lay down on a bulky blanket. Look a bit toward the north and enjoy the celestial show! Full Moon. Meteor shower gazing conditions will not be ideal, as the Moon may wash out all but the brightest Lyrids meteors. Keep in mind that any local light pollution or obstructions such as tall trees or buildings will reduce your sightings. Give your eyes time to adapt to the darkness once you move or face away from the lights.